Eloy and I were on the curb at 5 AM hoping to catch one of the hundreds of Barranca’s taxis. Apparently it was too early for them, so we decided to take one of the pirate motorcycle taxis that had been beeping at us. At 5:30 we were on the three-hour mini bus ride to Aguachica where we had breakfast and met two men who were representing other NGOs. They were part of our accompaniment responsibility. Then it was a 45 minute taxi ride to La Gloria on the banks of the river Magdalena. (I recommend following this trip on Google Earth for fun, though La Gloria is marked in the wrong place. Look for the little town to the west right on the river.) 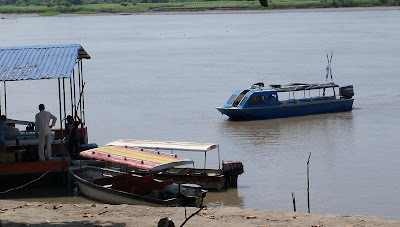 In the Gloria we boarded a small “chalupa”, much like the one pictured here, to another river town about an hour away called Rio Viejo. Victor was waiting for us with his 1999 Toyota Land Cruiser with the flatbed and wooden sideboards. This turned out to be three hours on the worst road I had ever been on. 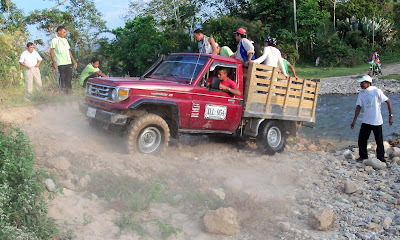 And I have been on some nasty roads both in the states and in Guatemala. This road had never been surfaced with anything. Pot holes reached 4 ft across and a foot deep. Bridges, and there were many, were mostly high cement obstacles that you had to figure out how you to get on on top of so you could cross. The bridge surface was usually 6 to 8 inches above the road approach. There had been huge rains in December this year that caused lots of mudslides, and cut the approaches to the bridges, so once your were on the bridge, only half of the road might be there on the other side to meet you. I was riding in the cab with driver and tried to ask in an off-hand way, “So, is the road usually like this?” He matched my off-hand manner, “Oh no, it’s pretty good these days. You should see it when it rains. I got stuck one time in the rainy season, and it took five days to get me out.” The word they use to describe this rode is carretera, the same one used for the main four-lane highway into Bogota. Puerto Rico Tiquisio, where we ended up for the night, is a town of several thousand people, and I was baffled as to how commerce could survive on a road like that. It turns out it also has river access to Rio Viejo, but it’s a six hour trip so we had taken the quick way in. The next morning we headed out to another small town for the scheduled meetings. 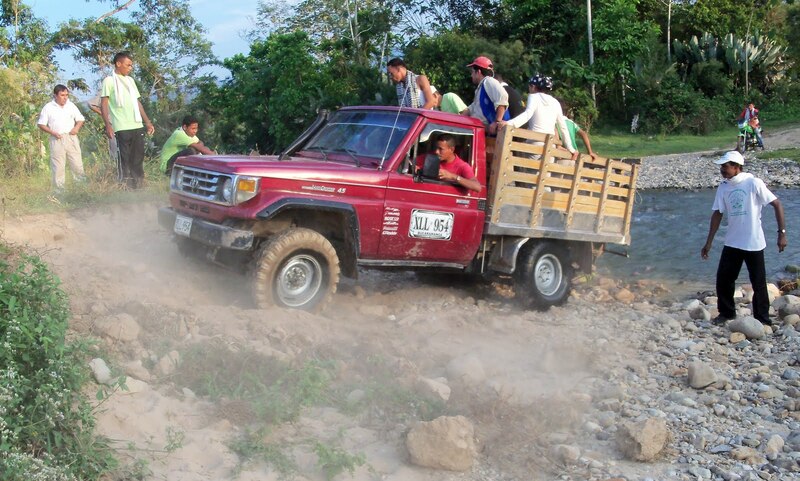 We started in a “flota” (photo) and landed in Puerto Coca an hour later where Victor was waiting for us with the Land Cruiser. This was a mystery to me, but I was trying to stay in my listening mode. We got in the back of the little truck, all 20 of us, and proceeded down a road even more primitive than the previous day. The developed parts were literal cow paths through pastures. No bridges that day. We drove through three rivers, at least four small streams, and a thirty-foot mud hole. On the way out later that day I was too scared to stay in the truck with so many people as it scrambled a five foot embankment. My point in this reflection is that the transportation buffet that I experienced was really a small and easily understood part of the trip. I was overwhelmed by the number of challenges facing the community. I was humbled by the fact that the community seemed to be perfectly happy with some of the things I saw as problems. Several farmers during the two days of meetings that they raised corn as one of their crops. I hadn’t seen any cornfields at all on the way in. I know cornfields when I see them. I grew up around them, and saw them all over the mountainsides in Guatemala, as well. On the trip out in the back of the truck I made of point of looking for them, and, sure enough, there they were. Another lesson. If I hadn’t even noticed the crop I was familiar with, how much else had I missed, crops or otherwise? Tomorrow, I head out for another accompaniment. My next reflection will focus more specifically on justice issues confronting rural Colombians. PS - If you are interested, Google Earth can help you follow my trip as far as Puerto Rico Tiquisio. La Gloria is mismarked. It is to the west and right on the river, but the rest are correct. The satellite views give you a good idea of the vast river and lake systems. I am so happy listen someone talk about Coca because you can know don't exist in the map, is so far.